The district town of Sindelfingen is located 15km southwest of Stuttgart. It has 60.000 inhabitants and is known for its automobile industry. Sindelfingen’s Mercedes-Benz factory is the largest automobile factory of Daimler. Sindelfingen’s history goes back to an Alemannic settlement in the 3rd century. In 1263, it was given town privileges but remained a placid country town. This changed in the 19th century when industrialisation made the local industry grow: weavers shops, machine-, shoe-, watch- and other factories came to Sindelfingen. The Daimler factory, built in 1914, worked for the armaments industry during World War II which led to a massive destruction of Sindelfingen. After the end of the war, many German refugees and displaced people from eastern Europe came to seek work and shelter there. Furthermore, many foreign workers came to the city in the 1950s. In 1957, the number of inhabitants had already grown from 8.500 to 20.000. To pay tribute to their new citizens, Gerlingen assumed the sponsorship of several groups: in 1995 for the displaced from Würbenthal (Sudetenland) and in 1964 for the Danube Swabians from former Yugoslavia. Since 1989, Sindelfingen maintains a partnership with the Hungarian city of Győr. In 1970, the house of Danube Swabians was opened. It is a cultural centre for the Danube Swabians scattered all over the world and contains a specialised library, is used for events and exhibitions and holds several organisations: the global governing body of Danube Swabians, the local association of Danube Swabians (German association) and the work group of Danube Swabian genealogists. Furthermore, a franchise of the Danube Swabian cultural foundation from Munich is located in the building and every two years, the federal state of Baden-Württemberg awards a Danube Swabian cultural prize. 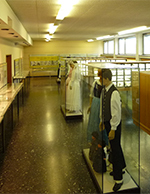 LEFT: Exhibition in the House of Danube Swabians. 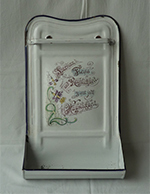 RIGHT: Wall pocket for kitchen utensils. 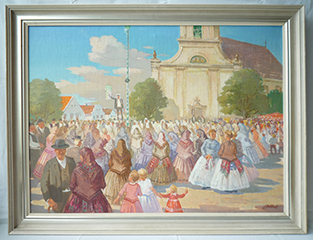 Oil painting by Franz Ferch: Banat parish fair, 1972. Tours of the house and visits of the library can be arranged upon previous notice by phone or in writing.